SpiderBasic does not recognize ProcedureDLL. ehbarba wrote: SpiderBasic does not recognize ProcedureDLL. Did you install the tools the way I described it on this page? I checked the installation, and it was Not Ok! I'm using Miva Merchant Mia is an engine and personal web server environment. I try with and without it installed and the error is the same. InitCGI() is only available starting with PureBasic Version 5.40. I was going to start a new topic but it would have had the same heading so I tagged on here. I too am having an issue with running any of the SpiderBite examples. I get this error - "Line 1: 'C' is not a valid operator"
Have checked and rechecked the installation to your instructions. I think it's OK.
SB compiles and runs as normal. Any help would be great. Thank you, Peter, as allways! swan wrote: I get this error - "Line 1: 'C' is not a valid operator"
Unfortunately, I don't have the slightest idea what could trigger this error. Please search for a single "C" in the code. Bit of an update but no cigar yet. Uninstalled everything (including SB) and reinstalled. Redownloaded all files, yet same error. A single "C" in code gives a syntax not that error. Now, the error only occurs following "EnablePBCgi" in the code. EnableASP, EnablePHP, etc is not effected. I'm using Win 10 and the web server is IIS. I also tried Apache but I don't think the error is reaching that point. Here is the simplest code that produces the error. Sorry to be a pain but I'd love to see this work. Okay, I think I figured it out. Please check if you have write permissions in the directory you specified under PbCgiFilename. If I (as you can see on the screenshot) create the cgi.exe in C:\intepub\wwwroot\ then everything works. If I want to write in C:\intepub\ (I don't have write permission there), I get the same error as you. 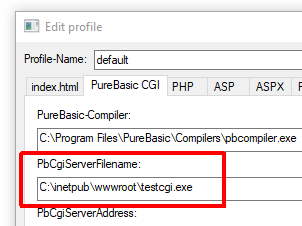 Now PB compiles and deposits the exe as per the config profile as it should. "error: error/NetworkError: Failed to execute 'send' on 'XMLHttpRequest': Failed to load 'http://localhost/PBcgi/'."